What are the different types of steam? When water is heated beyond its boiling point it vaporizes into the gaseous phase or as we more commonly know it, steam. The properties of steam vary considerably and are greatly dependent on temperature and pressure. Before we consider why we use steam, lets firstly consider the different types of steam. Saturated Steam (Dry Steam): This form of steam occurs when water undergoes sensible heating to raise the fluid to its boiling point and then vaporizes with additional latent heating. Heating this steam further, i.e. above the saturation point, produces superheated steam. Superheated Steam: Steam in this form occurs when saturated or unsaturated steam is heated beyond the saturated steam point. The result is steam at a higher temperature and lower density by comparison to saturated steam at the same pressure. Unsaturated Steam (Wet Steam): This is probably the most common form of steam which is usually generated by steam boiler plant. It often contains non-vaporized water molecules which are carried over to the steam being transported throughout the piping distribution network. These water molecules can affect the performance of the steam plant and as such, it is for this reason steam systems are fitted with condensate removal equipment. Why do we use Steam? In its simplest terms, steam offers an excellent means of transferring a large mass of heat energy, usually via a piping distribution network. In terms of the operation of steam distribution systems, it’s the heat energy, pressure, temperature and flow rate of steam at each demand point which is of importance. This therefore places key emphasis on the design and operating performance of the piping distribution system. Steam for power plant applications is often required at relatively high pressures and frequently needs to be superheated (dry gas). The presence of superheat improves the thermodynamic efficiency of the turbine operating cycle and also minimises condensation which can lead to erosion, leaking joints and glands. This in turn reduces the overall mechanical efficiency of the power plant. In general terms, a good system design will be based on a steam operating condition which yields the lowest pressure that will provide the heat output required, saturated and as dry as practicably possible. An effective steam plant system design will produce steam at the desired quality (as dry as possible at the point of demand), will ensure the steam isn’t required to do more work than necessary, will be based on the process plant and equipment having a large enough heating area and ensure that the effective heat transfer from the steam to the process takes place at the highest practicable rate. The overall design can be enhanced further by ensuring that any heat given off from the process itself is harvested and utilised elsewhere on perhaps another application. Can we Reduce Steam Demand? Surprisingly, a considerable amount of heat energy is wasted in steam being required to carry out more work than necessary. When reviewing your steam plant, perhaps a useful starting point is to consider all components in the system between the steam generator and the demand point(s) which unnecessarily add to the total system heat demand. In general, when designing new steam systems, a good design approach is to consolidate all equipment with a steam requirement to one area and locate this area as close as possible to the steam main and ideally, steam generation plant. There are a number of areas which can give rise to a reduction in steam demand. For instance, any steam pipework becoming redundant should be isolated or disconnected from the steam main as having redundant lines is particularly wasteful of heat energy, particularly if the piping is unlagged and/or exhibits signs of leakage. Let’s consider steam pipe sizes. If a steam pipe is oversized given the steam flow rate required, it becomes a continuous point of energy wastage. If the insulation on a steam pipe is in poor condition, has been applied incorrectly or is of a poor quality, the pipe will incur increased radiation losses which essentially means that some of the heat energy inherent in the steam line is simply wasted. A greater volume of condensate will be formed due to the greater heat loss which means wet steam will be delivered to the point of demand. To overcome this, additional steam trapping is required. Oversized lines are also by their nature, more expensive to install owing to the cost of the larger pipe, relatively higher cost of piping supports, fittings valves, insulation, and labour. These larger pipes can also contribute to a lower quality of steam due to the formation of additional condensate in the lines as noted earlier. If steam piping is undersized, the system will incur higher pressure drops and insufficient steam flow to the demand point(s). There is also a higher risk of water hammer, noise and erosion. The enemy of the steam plant, water hammer, can cause damage to steam pipes, equipment and personnel and thus the likelihood of this phenomenon should be given due consideration and be eradicated from the system. In older steam system installations, there can be bypass arrangements installed at steam traps. These bypass connections are often unnecessary and left open giving rise to significant heat loss. Furthermore, the correct and strategic installation of steam traps with appropriate air venting can eliminate the requirement for these bypasses and thus, the associated energy wastage. In general, the lowest permissible operating temperature should be selected for a steam system. This obviously will optimize the amount of fuel required to generate the steam and maintain the design operating temperatures. Giving due consideration to the points discussed, the overall system heat demand can be optimized to ensure the system is operating as effectively and efficiently as possible and consequently, reduce the overall site steam demand and associated plant fuel costs. Can the Steam Distribution be Improved? The dryness and quality of steam delivered to any demand point in a steam system depend heavily on how the steam is generated and of course, distributed throughout the site. In steam systems which are required to generate saturated steam, the steam begins to condense the moment it begins its journey through the distribution pipework. In general, the wetter the steam, the lower the quality for downstream process heating requirements. In such scenarios, steam carrying moisture can create a water film on the inside pipe surface. At this point it’s worth noting that, the water film is a very poor conductor of heat which of course, can inhibit the performance of the installation. The steam distribution system can be improved by ensuring there is a correctly sized steam trap immediately downstream of the boiler plant. This trap will collect condensate from the lines thus improving the overall quality of the steam and improve efficiency. Another point for consideration is the level of insulation fitted to the distribution pipework. Poorly insulated steam lines give rise to the formation of condensate in the steam, hence reducing the steam quality. The steam lines and in particular, flange connections and valves should be properly insulated to maximise the steam quality. When selecting the insulation thickness for distribution pipework, the optimum insulation thickness is the economic thickness. Economic thickness considers the installed cost (material & labour) of the insulation as well as the ongoing value of energy savings over the lifetime of the plant. It is essentially defined as the thickness of insulation that minimizes the total lifecycle cost. The following graph illustrates the lost energy cost over the lifespan of the system which decreases as the insulation thickness increases. The total cost curve relationship represents the sum of the installed insulation cost and the cost of the lost energy. 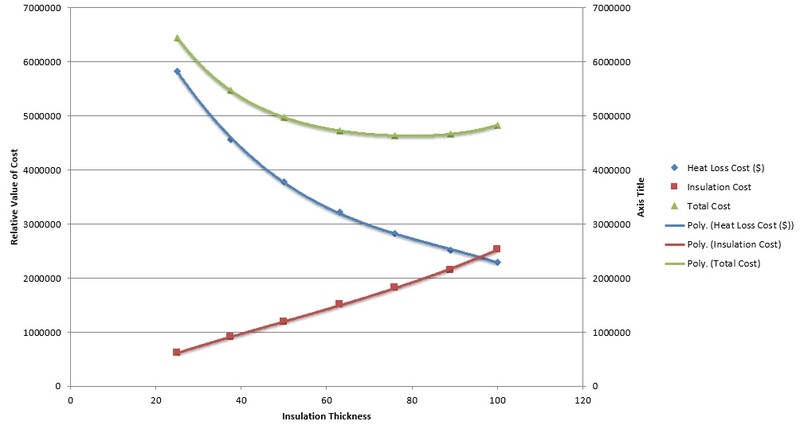 The total cost curve shows a minimum value at the apex which represents the economic thickness of insulation. Overall, any water/condensate which develops in the main infrastructure pipework should be collected as early as possible at system low points. In existing steam installations, it is very often the case that the installed pipework becomes too small or too large owing to changing usage patterns or changing demands imposed on the system which can develop and change over the years since the plant was originally installed. As a rule, pipes which are too small can result in lower than required steam flow at the demand point and also, pipes which are too large cause excessive heat loss due to the larger than necessary surface area/radiation surface. A particular issue for consideration is elements of the piping system which have sagged due to lack of adequate piping supports. This sagging can result in water lodging at the base of the pipeline at the lowest point. This water can be a source of water hammer in a steam system which can be detrimental to the operation of the plant. Also, the passing steam can collect moisture from the water-logged point which if not removed by steam traps downstream, will be delivered to the demand point and once again, lower the quality of the delivered steam. Another area of concern is the presence of air in the steam lines. Air gets into the lines when the boiler plant is off. This air should be vented from the distribution mains to improve the transfer of steam through the system. The air can be removed through the use of appropriately positioned thermostatic air vents. As a minimum, these vents should be fitted at terminal ends of various pipe runs. It was noted earlier that the water film on the surface of the pipe is a poor conductor of heat. The air film however much more drastic. In fact, it is widely documented that air is over 1,500 times more resistant to heat transfer than steel piping material. It stands to reason that both the water and air films should be eliminated from the piping distribution system as rapidly as possible. Another point of notable interest is the condensate and its recovery from the steam system. Condensate is essentially purified/distilled water which usually includes chemical treatment – ideal for use a boiler feed water. Condensate is of high monetary value owing to its inherent heat content and the fact it is of high quality, i.e. purified hot water. It should therefore be harvested at every available opportunity in the steam process. After all, it is much more cost effective to re-heat hot condensate into steam than it is to heat cold make up water into steam. In fact, condensate can be almost one third of the cost of generating steam. Take Note ! When developing or designing a condensate system, it should be borne in mind that condensate is a two-phase fluid and as such, sizing of the condensate lines is a much more complex process. In such cases, the fluid velocity requires careful consideration. Traditionally, condensate lines were sized on the basis they were liquid carrying pipelines. 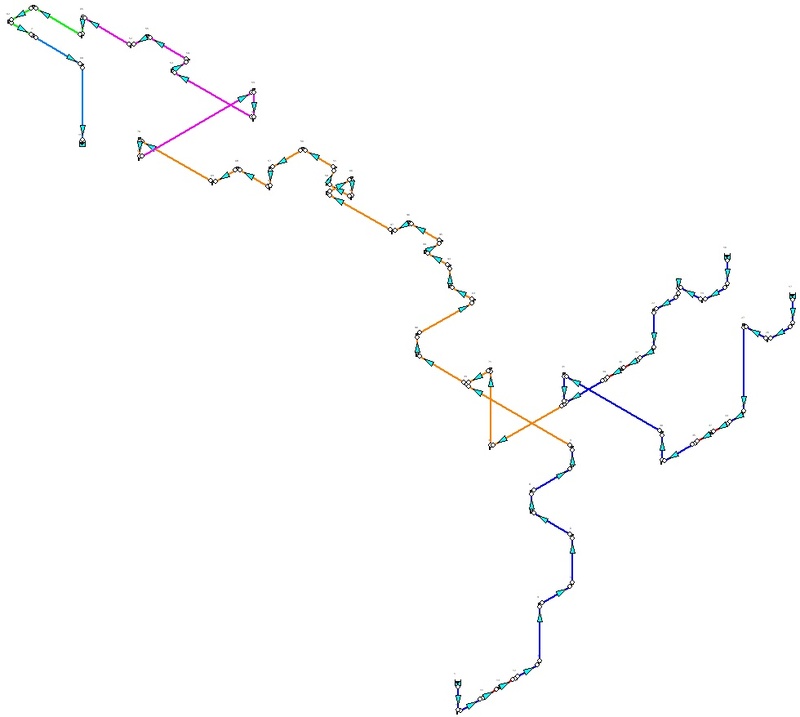 However, as we now know, these lines can carry both liquid and flash steam. So what can I do with the recovered condensate? Firstly, we have seen that it is perfect as boiler feed water. However, it can also be used for space heating systems. The scenario which suits your site may be dictated based on your specific set of site conditions and requirements. Giving consideration to the above, the performance and efficiency of a steam system can be radically improved through careful and considered recovery and usage of hot condensate. This document attempts to outline some key points to be considered for when reviewing the performance and efficiencies of new and existing steam systems. Ensuring steam plant is consolidated to a specific zone, optimizing the amount of steam required including its temperature and pressure as well as its quality will increase plant efficiencies. Careful selection of pipe diameters will also have a considerable benefit in ensuring the plant operates effectively and efficiently. A useful approach to take when reviewing the design and operation of any new or existing steam system is to think of the heat energy desperately trying to escape at every available opportunity! What can you do to prevent this phenomenon and develop a more effective and efficient system? Developing such a system will go a long way to reducing the overall fresh water demand, heat demand, associated fuel costs and site emissions. Steam & Energy Conservation – Spirax Sarco. The Proper Use of Steam – Spirax Sarco.